--> What is a fanlisting? 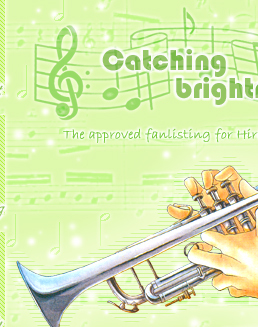 Kazuki is an energetic third year who plays the trumpet. He is tall and in shape (he runs every morning). He's very friendly - in an almost aggressive way - and outgoing. He has little sense of social boundary. Kazuki has an enormous appetite, as he is constantly eating (especially baked goods). He quickly befriends Kahoko. Because of him, Kahoko learned the true meaning of music, that it is enjoyed by everyone. After that Kahoko began to love and enjoy music better. In the middle of the series,he starts to call Kahoko "Kaho-chan", instead of the usual "Hino-chan", thus suggesting he has a rather obvious crush on her. He also admits to Azuma that he has a crush on Kahoko, saying "don't make fun of me" when he asked. Basketball is one of his favorite sports. 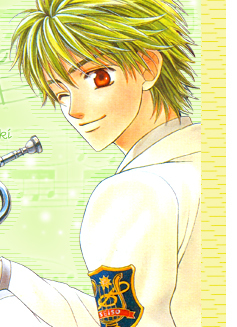 He has an older brother named "Haruki" in the series (Episode 15). On-line since June 22th, 2008. Patterns and brushes by:Obsidian Dawn, Celestial Star, Easy Elements, sideduck,and spiritsighs. Scans by: aestalitz, Saa-chan, Banchan, Finestela. by Yumeta Complany. All righs reserved. Layout & contents are (c)Akira K.S. Do not reproduce anything without permission.